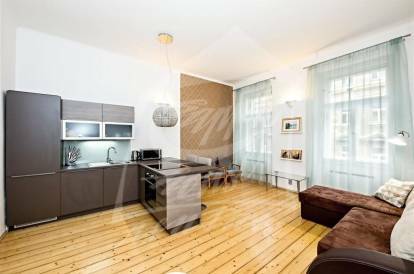 Bright, beautiful, furnished one bedroom apartment on the first floor of the brick house with an elevator in Prague 3 - Žižkov. The modern kitchen is equipped with a fridge, ceramic hob, oven, dishwasher and microwave. Bathroom with a shower, toilet and washing machine. All electronic appliances are available – iron, dryer, vacuum cleaner etc. Towels and bed linen also provided. Internet and UPC cable TV with around 50 programmes available. Laminated floors and tiles. Nearby is the park ,,Parukářka" and ,,Vítkov" Hill, which encourages to walks, rest and sports, National Monument on ,,Vítkov" Hill and Army Museum Žižkov. All civic amenities in the area. Excellent transport links from the tram stop ,,Lipanská", which is located just two minute walk from the house and bus stop ,,Rokycanova" five minutes from the house. Metro A station - ,,Flora", two tram stops. The owner does not want animals in the apartment. Charges are billed separately, security deposit equals to two month's rents. Interested in this property, ID 34863?